To the basic printer design, I made a number of modifications (of course). 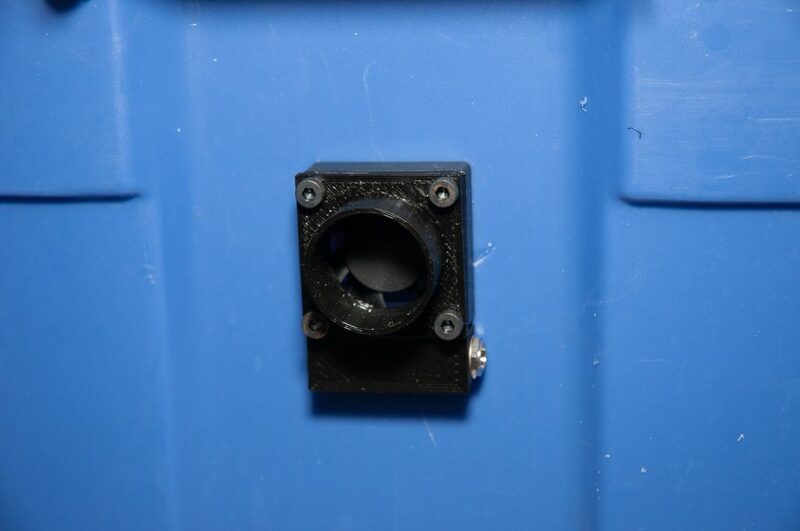 Te major changes included a high performance extruder – Micron EME Cobra all metal extruder with thermocouple sensor as well as a 24v power supply to hit the high temperatures I needed for printing Nylon and other high temp plastics. The printer control is based on the open source Marlin software (which is incredible) and Rumba controller board. The Marlin software is highly configurable and supports many dozens of printer configurations, controller boards and commercial printer. However, this configurability comes at a cost (learning curve) for the infrequent user. This configuration (D-Bot) also did not come without aggravations. The dual z stepper drivers for the vertical motion, are prone to getting out of sync when powered down (one side lower than the other). This was aided by the habit of the cats walking across the printer when I was not around, as well as the default power down of the stepper drivers between prints. So for every print session, I would need to re-level the printer bed across the X axis (left to right as you face it) a few times. In addition, the original microswitch based home sensor was not that accurate. So after levelling, I would need pfutz with the zero position to get the first layer of the print to come out at the right thickness. The microswitch was replaced with an optical sensor last year, but it was still on only one side. Printing igus iGlidur 180 Y carriage slider bearings to replace the v-roller wheels. This lead to better print quality. The igus filament required printing at 250C so this was one of the uses of the high temperature print head (in addition to nylon). The X axis will need to wait, as a future project. Moving from Marlin 1.0.9 to 1.1.9 (latest and reportedly final version) of the software that drives the printer. This meant carefully handling all of the changes to the software, recompiling and uploading the software multiple times to get the printer back in working order with no other (physical) changes. 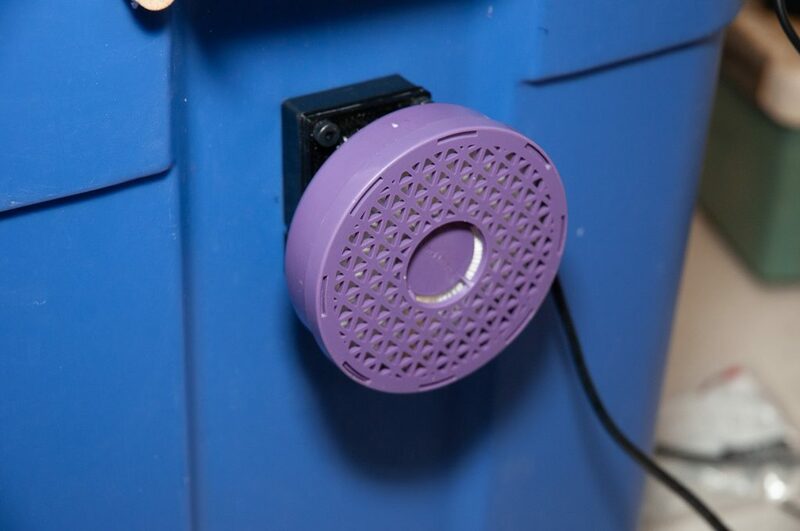 Adding a second Z-axis (vertical) home sensor so that each of the Z stepper drivers would have their own independent home sensor and after homing the printer the bed would be basically level. This required some adjustment of the parts in Sketchup (not easy with STL models) and then some Marlin configuration changes to make it work. The homing of the printer is now SO much better. Not just the dual z sensors, but the Marlin homing logic is much better and doing it properly (back off and fast seek in and then back off again with slow in to get final zero). Adding a BL-Touch for automatic bed leveling sensing. The mounting bracket for the BL-touch was based on using the new bottom Y carriage bracket for the igus slider bearings. Getting the BL-Touch to work was the most infuriating part of the project. The documentation of the theory of operation of the BL Touch is spotty and this is coupled with contradicting info for configuring it in Marlin on the web as well as scant info on doing it with my 3d printer controller board. So yesterday’s snow storm gave me the quiet break to sit down and systematically dig into how to do this. In the end, it worked (and I ended up with a spare BL-Touch). So now I have a radically improved 3D printer and it is ready for more projects. Today the Bresaola had lost enough of its weight to be ready for tasting. 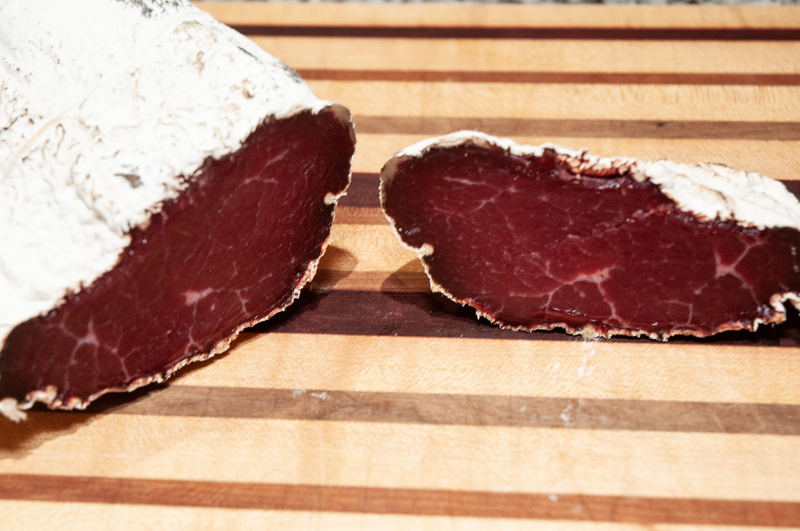 This is a continuation of my previous post on making the Bresaola . Started 1/5/19, tasting 4/13/19 The process took just over 3 months. The meat was curing in the dry box in the basement with the dry cured ham and more dry cured pork loins (Lonzino). 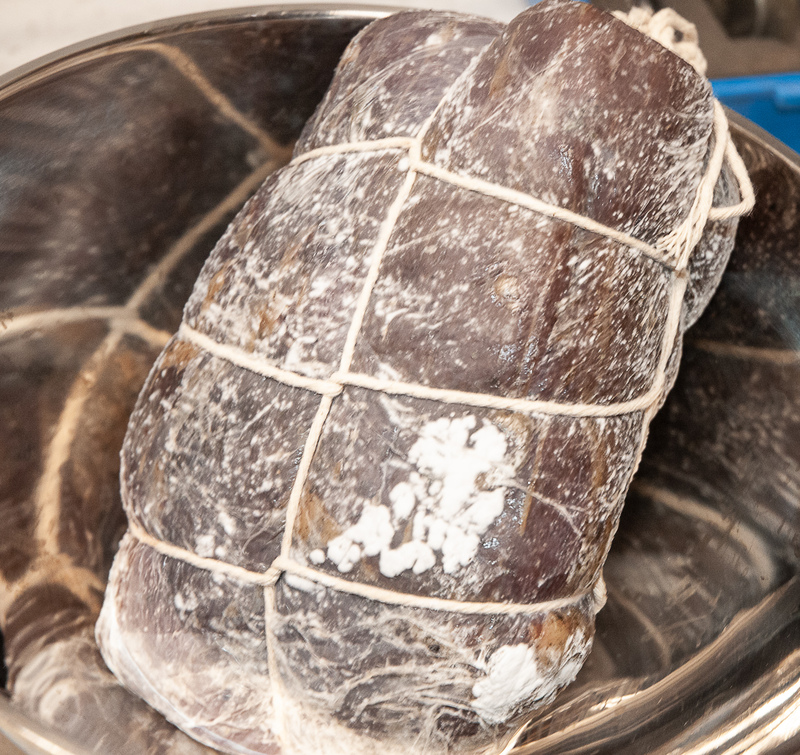 The bresaola was weighed and pulled today . It had lost 44% of its starting weight. The meat was covered with an even coating of the mold until I dropped it. So then I wiped it off with a damp towel and vinegar. So you can now see some of the surface texture. First cut. You can see how dark the meat is. A bit closer and you can see that the coloring is even across the meat with little extra darkening at the edges indicating that the drying was fairly even. Feeling the meat, the top end is a bit firmer and presumably drier than this which is at the bottom quarter point. The collagen is very well adhered to the meat, more so than with the pork loins. Tasting – delicious if a little bit salty. Saltiness is comparable to commercial prosciutto. There is a hint of the rosemary and juniper flavors but very mild. The meat is very tender and almost a bit too soft yet. Hint of a “minerally” flavor which is I guess to be expected with the eye of round roast. Meat is very dark red as you can see and slices nicely. This has a stronger “meaty” flavor than the pork loin. Putting the large piece back in the box for another week. Small piece into the fridge to eat. Next time, I will rinse thoroughly before applying the collagen to get more of the salt off to see if I can reduce the saltiness. I had not rinsed much so that I would not wash all of the spice mix off. I would rate this one also a success. 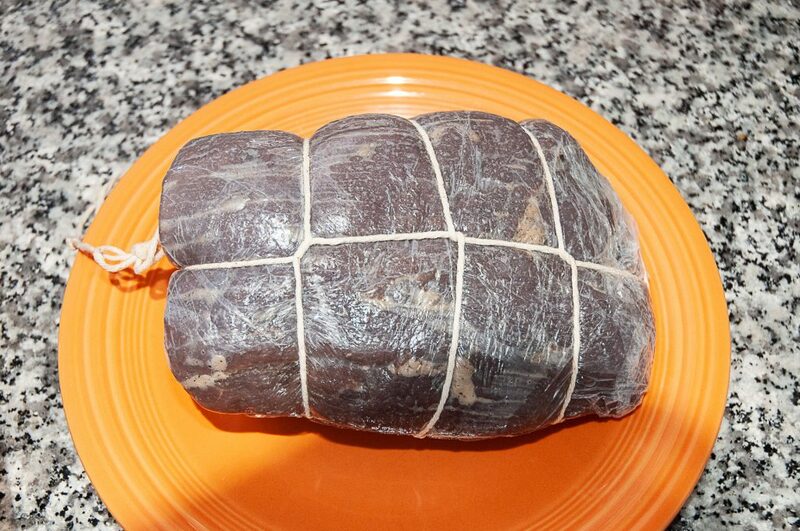 I am making the Bressaola from an Eye of Round roast. 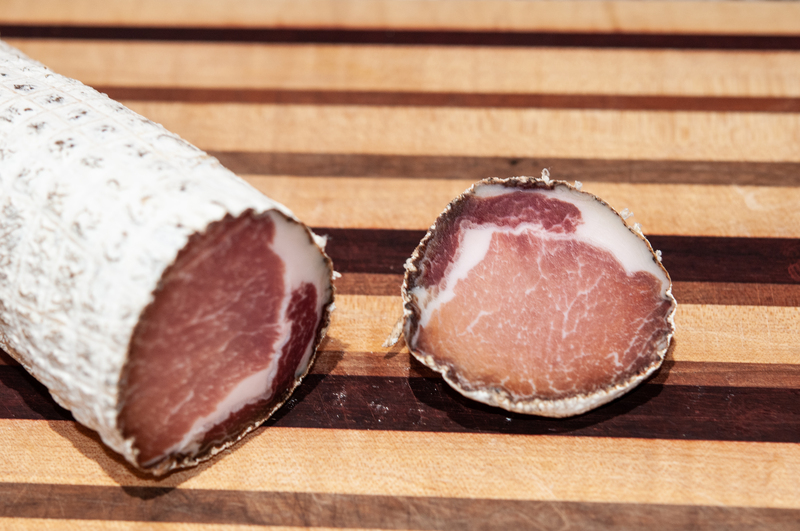 This is based on the Bressaola recipe in Charcuterie by Michael Ruhlman and Brian Polcyn. I have converted it to a slat and cure by weight and adjusted the herbs and spices as it is mid winter and my Rosemary and Thyme are only dry now not fresh. After trimming the roast of fat silverskin and any nicks, it ended up at 1233g. Finely grind the mixture together until powdered in a mortar and pestle. I don’t like dragging out the blender for this and these flavors would not help my coffee. Divide the mixture in half. 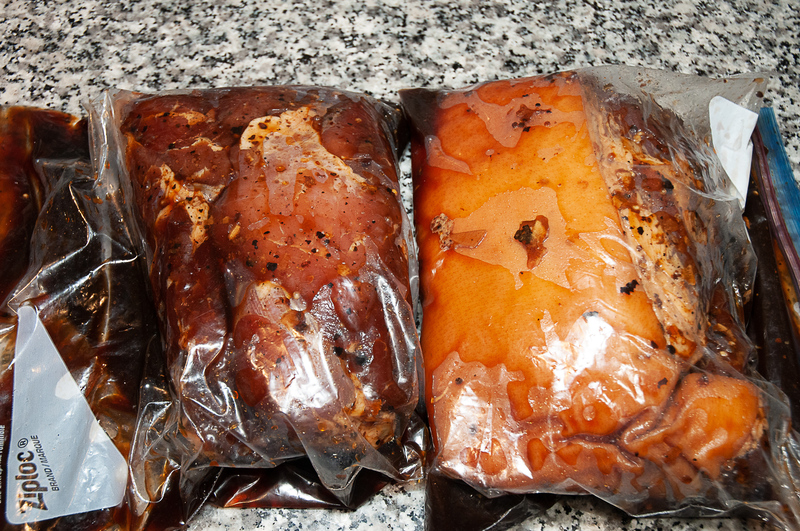 Rub the roast with 1/2 of the mix all over and place in a plastic bag in the fridge for 1 week turning every few days. After 1 week pull it out, drain any liquid and then apply the other half of the spice mix. Refrigerate for another week. Remove the roast from the bag, rinse well removing the cure and spice blend. 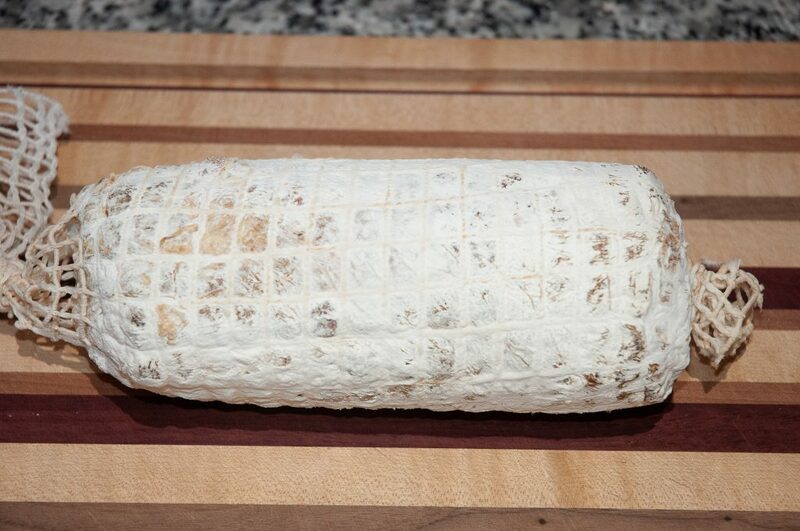 Place on a rack at room temperature uncovered for 2-3 hours. This will dry it enough to be ready for wrapping. Wrap in 1/2 sheet of collagen, pressing it tightly against the meat and then truss with butchers twine. 2 vertical wraps and 3-5 horizontal wraps. 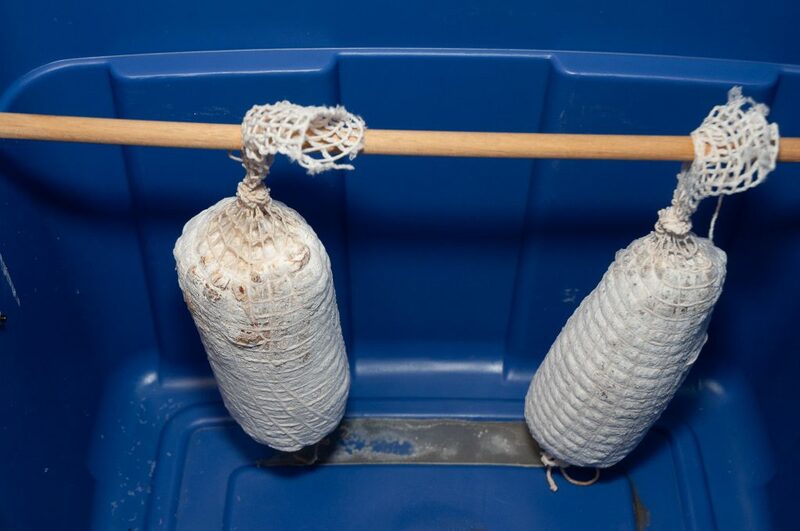 Make a loop in the twine so it will fit over the dowel in the dry box. Prick all over with a sanitized sausage pricker. Dip in a solution of Bactoferm 600 (penicilium mold culture). Here I have it out for weighing after 1 week. You can see mold growth and it is much heavier where it bumped the mold covered pork loin. Beware this is still an experiment in progress. Get the book while waiting for the tasting post. 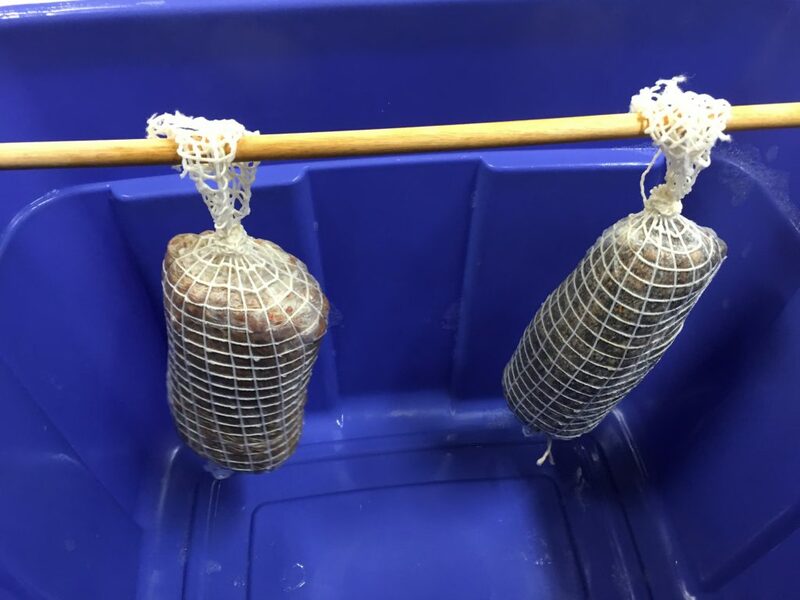 TheSausageMaker.com: Dry Aging Collagen Sheets for Dry Aging Meats 22″ x 24″ (5 pcs) and Bactoferm Mold-600 (Penicillium Nalgiovense) and Sausage pricker. You can also order their products via Amazon but it is much more expensive but with free shipping. So if you need several things direct is cheaper. As I mentioned previously, I really like dry cured ham. Prosciutto & Speck are great. However, I am still taunted by my family for the “salt ham” episode where I ordered a “virginia ham” off the internet. It was not popular. 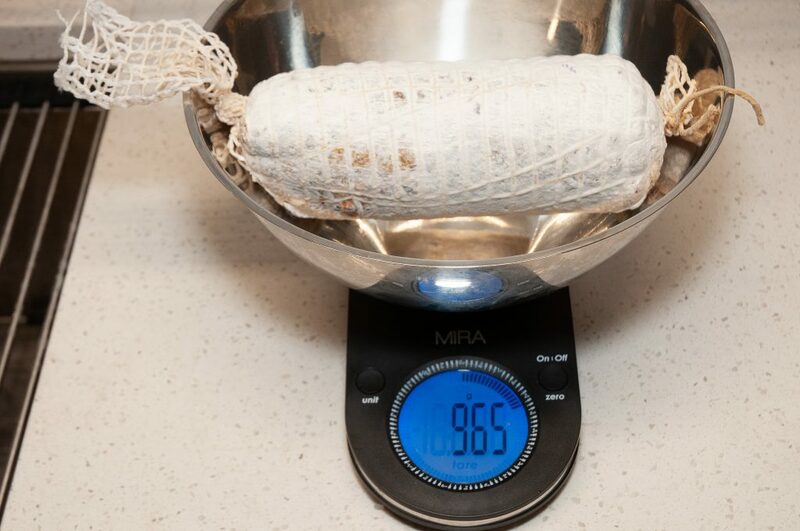 So, with that lesson and others, I have settled on making my dry cured meats with “by weight” proportions rather than salt box or “cover it with salt” for x days recipes. The concept is that there is an ideal salt & seasoning to meat weight ratio. This give you lots of latitude on the curing time vs . immersing the meat in salt and pulling it at “just the right time”. From the research I have done, the immerse it in salt method seems to be optimized for production curing on an ongoing basis with tons of meat per day. However, at home we are not doing “production curing” we are doing a few pounds per month at most on an erratic “schedule” (try not to run out before the next batch is done) . So, I want small batch repeatability and the “by weight” salting / curing method wins. Take one fresh picnic ham (front leg) and carefully debone it. Care must be taken that you are not creating cuts / scars that will harbor bacteria or molds. 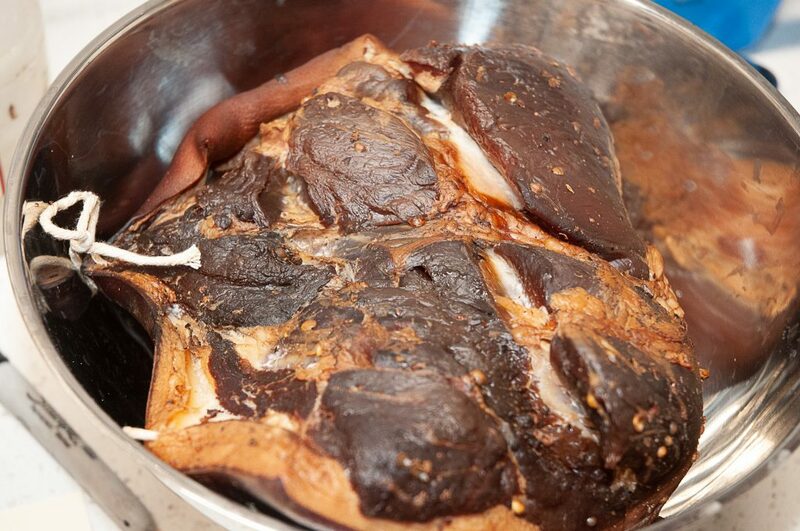 The goal is to have a couple of piece of meat with a clean, unscarred surface for curing. The bone and attached scraps are saved for future goodies whether soups or plain old baked beans. Next, we must cure the meat. The slat and cure are by weight percentages. The spices assume approximately 1 KG pieces. You should scale up or down accordingly for what you have. Mix the above ingredients and set aside. The boned out picnic ham should yields 2 approximately equal sized pieces (skin on) . Take 2 large zip lock bags and place the “halves” of the ham in them. Now pour in proportional amounts of the cure in each bag. Place in the fridge. Turn every few days (2-5). After 2 weeks of cold curing in the fridge, the meat should have evenly distributed the cure. 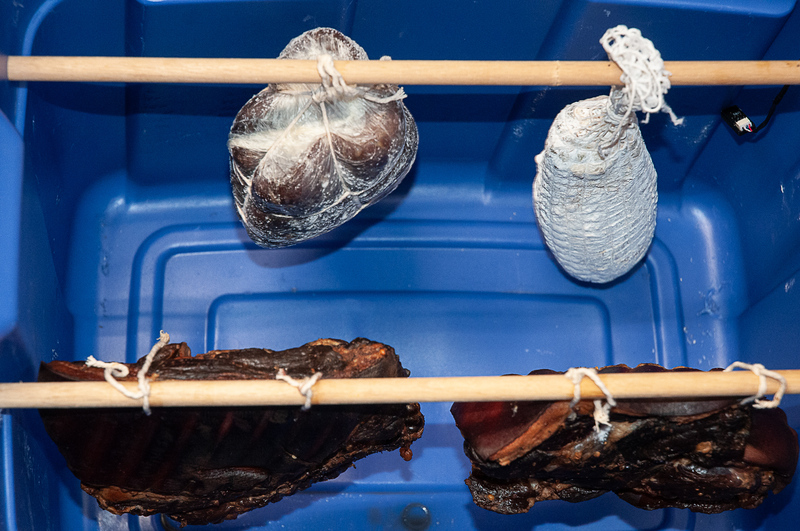 Next the meat is removed from the bags, dried with paper towels and then set on racks in the refrigerator to dry and form a pellicle (thin tacky skin). Now is the time for cold smoking. With cold smoking, it is important to understand that we are not trying to cook the meat at this point. The goal is to add smoke for flavor and reduce, if not prevent mold growth during the drying phase. The meat is cold smoked for 10+ hours. 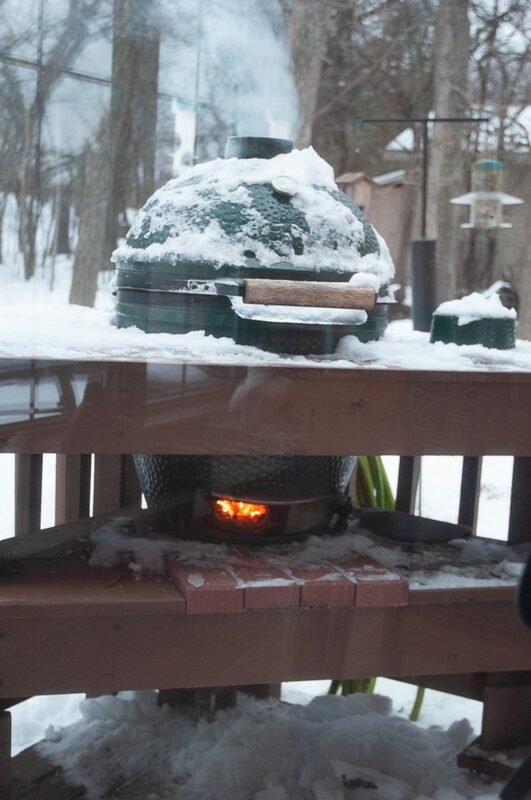 The Big Green Egg was the smoke chamber, with an A-Maze-N pellet smoker grate providing the smoke. After smoking the upper edges of the meat were pierced for butcher’s twine to hang in the dry box (smoke aroma is good but a bit harsh about now). I used Traeger Signature Blend pellets. The meat is then hung in the “high tech” dry curing chamber and now we wait. The white pieces are the dry cured pork loins. I like Prosciutto, however it is bit hard to find round here not in a pre-sliced / pre-packaged form. 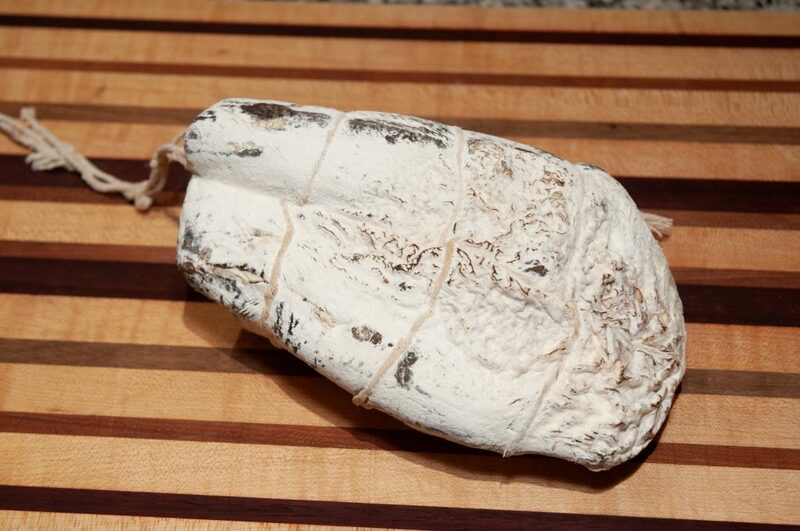 Once sliced it does not keep well oxidizing and rapidly develops off flavors. Speck which is a northern Italian /Austrian version which is smoked and also has great flavor but is not to be found around here. Plus my wife objects to the $70+ dollar shipments from Amazon, which I order in the winter and then UPS then throws in the ditch by the mailbox rather than delivering up to our doorstep (another long story). However I can cut up the chunk, freezing some. I slice off what I need as I need it and retain the fresh cut flavor. So after reading a few books on dry curing and watching yet more YouTube videos, I decided to tackle making some Country ham / Speck. The curing chamber was already constructed. 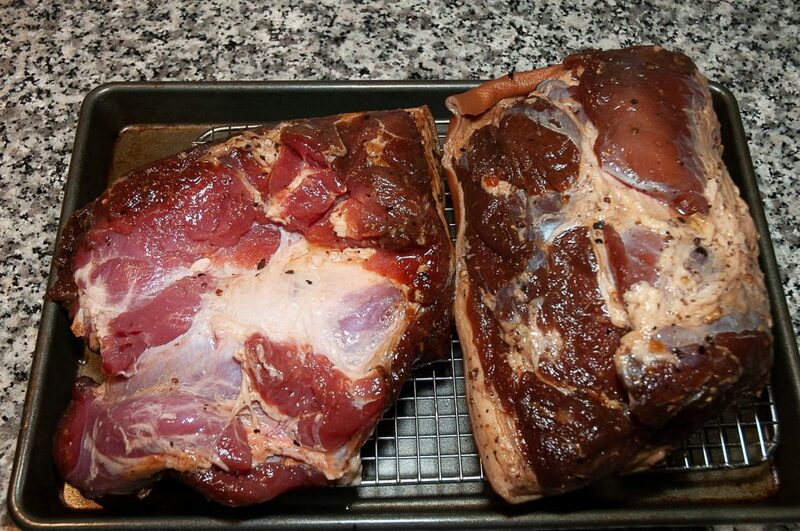 So now the problem was how to procure the raw ham and then cold smoke before drying. 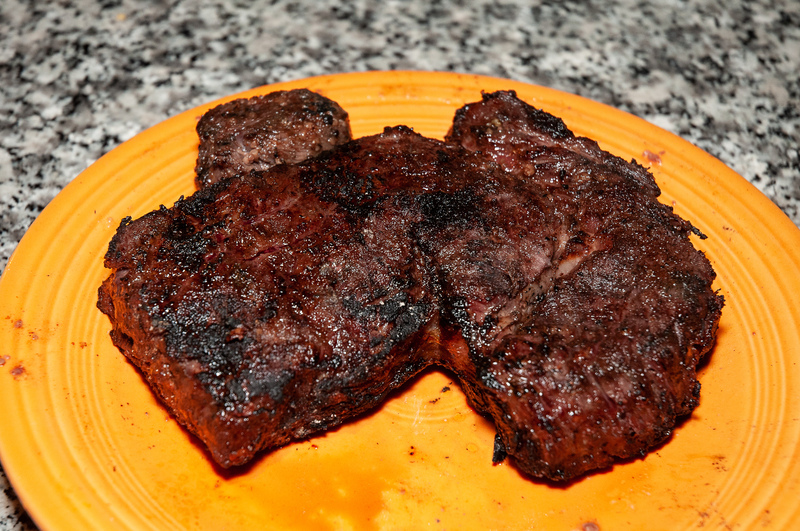 The meat was easy as our local grocer – Woodman’s, had the fresh front legs (a.k.a. green picnic hams) on special. 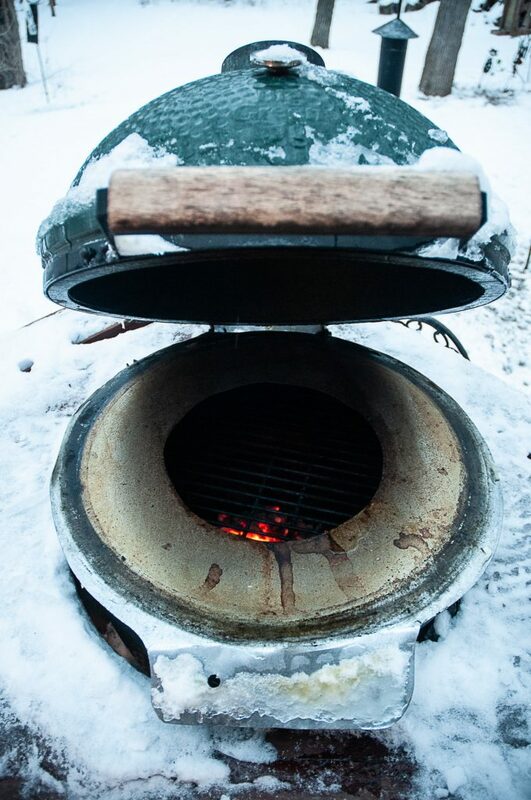 Meanwhile it is mid-winter in Wisconsin, meaning my Big Green Egg was frozen shut (really frozen shut with > 1/2″ ice covering) and I did not yet have a cold smoke generator. I have smoked a lot of meat on the BGE but it has always been hot smoked (190-230F smoker temp) but for these hams we are looking for <90F smoker temp. After some research which lead to both very expensive and very simple / inexpensive options I settled on the A-Maze-N 5×8″ smoker which uses wood pellets. Nice and simple, no modifications to the grill or having to connect air pumps as on some of the more expensive models. Metal ring used in between the gaskets to thaw the egg in winter. Next day I add a few big lumps of charcoal as spacers and place the A-Maze-n smoker with mixed wood pellets and get it lit. Once lit, blow out the fie, add the meat and walk away. Internal temp of the BGE averaged 46F over 10 hours (that is COLD smoking). When doing my research on foods, especially fermented or cured, I have learned to look first for the “tasting” post or video then decide whether to look at the preparation posting or video. If there is no tasting video – just assume it did not turn out. Probably the best that I have seen are Gavin Weber’s cheese making videos. When tasting he tells it like it is – not all turn out and some are interesting surprises. 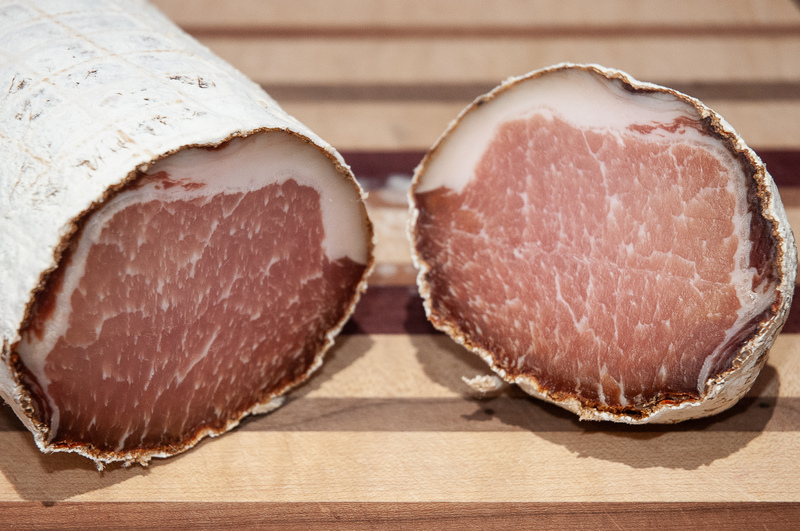 This experiment started back on Dec 15, 2018 and my first post on it was: Making Lonzino – Dried cured pork loin (Yes, I waited to see if it was a slimy mess or not before the first posting). Over the intervening weeks ,I took a few photos and weighed the pieces to track the progress. More meat into the chamber. In this case it is some dry cured ham similar to Speck. Smells so good. 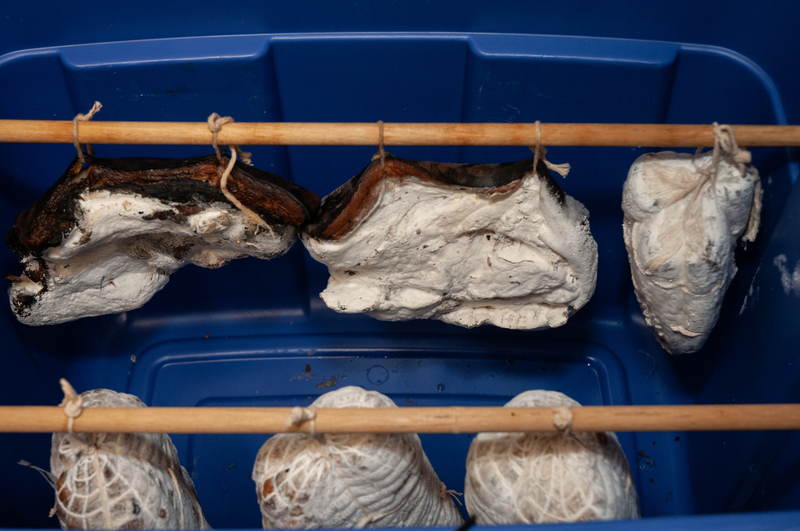 he last couple of weeks have not been optimum for drying as I had to move the chamber to the garage as I was doing some wood project finishing in the basement and did not want the fumes to impair the flavor. So I have been shuttling it between garage and basement depending on the temperatures (it reached -30F here) and extraneous odors (garden tractor which I use for plowing stinks on start up). This means the ambient temp has been anywhere form 28-58F depending on where the box was – not ideal. Plus I have been adding more meat and it may be tasing the little fan a bit with the added moisture. This is definitely a success. The flavor is just what I was looking for with the pork, fennel and pepper. It is a nice subtle blend. The outer layer of collagen and mold is discarded before eating (although it is edible). The texture is nice, but I want to dry it a bit more to get it a bit firmer. At this point is just a bit softer than prosciutto. I will probably trim the fat evenly next time. The meat is a bit softer near the fat layer. 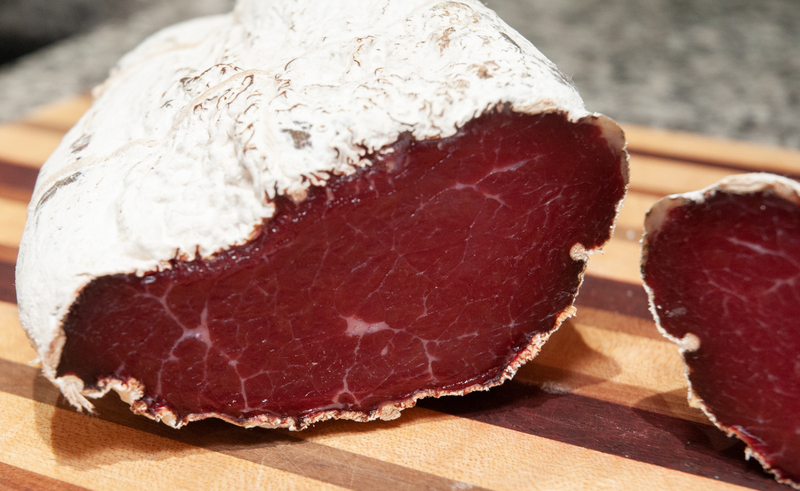 The outer layer of meat is a bit darker than the center which could be a bit of case hardening (outside drying too fast) but the texture really does not vary much. Stay tuned . More projects underway. 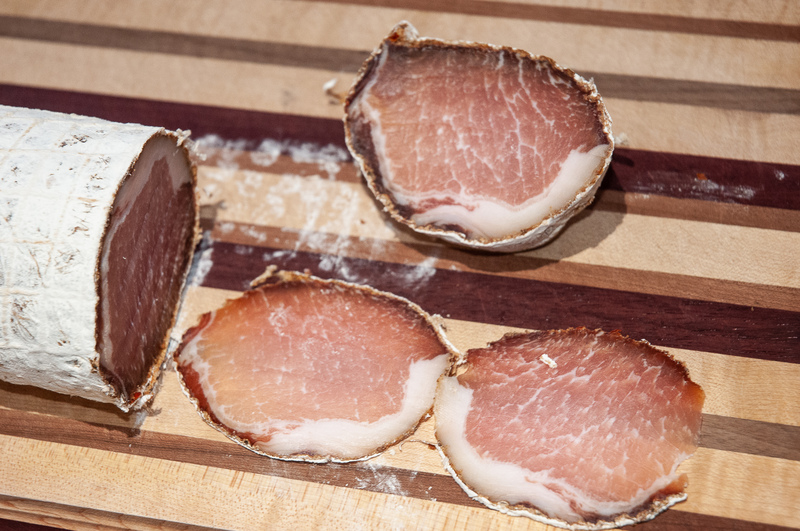 Dry cured ham – similar to Speck, and Bresaola which just went into the box today after 2 weeks in the fridge. I also brought some in to work and ran samples past a few of my friends. Overall the rating was excellent. Probably 60% would like it a bit drier / firmer but all want more. So, the other piece is going to dry to 35-40% weight loss and I will run another test. Overall, I am very encouraged by the consensus on the results! Update 3/17/19 The second (plain pepper) piece was dried to 38% weight loss and the group appraisal was that it has better texture. However the fennel / spicy flavoring has the taste edge. Plus a variety of youtube videos. Ignore any that post only a “making ” video but no “tasting” video. My favorite youtube video is “making capicola” she reminds me of my grandmother and covers the wrapping in collagen sheets before hanging. Pasties are what in some countries would be called “hand pies”. They were the standard lunch of Welsh / Cornish miners. They were brought into our family due to the Iron Mountain, Michigan iron mines. My grandfather was one of the miners for a time. This version is the one taught by by grandmother (yes 4 ’10” Italian Grandmothers make Great Cornish pasties). This version is extremely simple, no fancy ingredients and a very thin, light and flaky crust. The crust is far more tender than the miners would have carried (it would have crumbled in their pockets) or what is sold as “pasties” in the grocery store. We have kept the recipe to what she taught me with one exception, we have substituted sweet potatoes for half of the (white) potatoes. No parsnips, carrots, gravy, rutabagas or other things that folks put in pasties for us (but feel free to experiment). The recipe is as Grandma Ann made it. 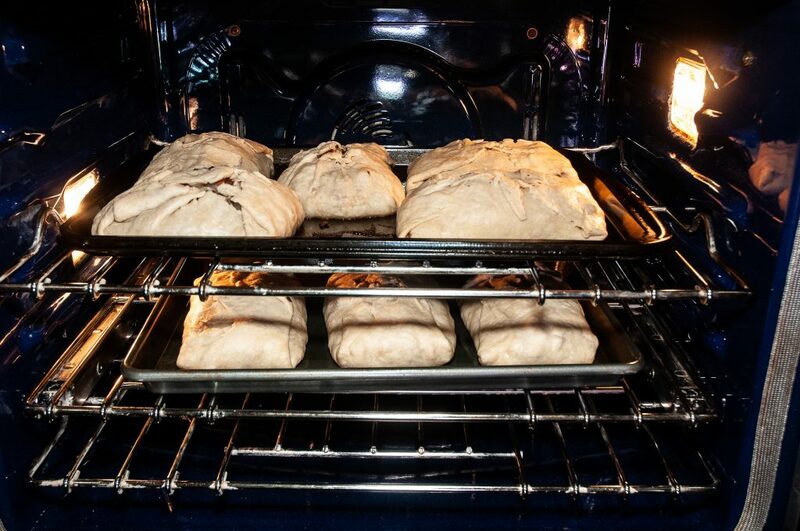 6 pasties – single batch. We always make a double batch (12) . I have been known to say:” If you are going to make a mess, make a BIG mess”. It really takes very little longer over all to do the double batch. Mix the filling with a pastry cutter. Work it as little as possible and keep it cold. After mixing place in the refrigerator to chill. Each crust should be roughly football shaped and about 10×12 inches . Yes, this seems wasteful to use the plastic wrap per sheet of crust, but it is the key to being able to get it so thin and wrap the filling with it . Cover the pie crust with a damp towel and refrigerate while you make the filling. If you use grocery store ready made pie crust, it will be edible but more like you get in the store. It is really worth making your own! 1.5 lbs 90% lean ground beef (grandma would often substitute ground venison as it was cheaper and leaner than grocery store ground beef). From my experience 80/20 ground beef is far too fatty and the crust gets soggy. Our newer variant substitutes sweet potatoes for 1/2 of the white potatoes – family favorite! Mix the filling well in a large bowl squishing it between your fingers as you go. The goal is an even mix of the meat onions and potatoes with out large lumps. Divide the filling evenly (each portion would be a good big double hand full). Place the filling centered and packed on a piece of the crust. Bring the crust up and over the filling using the plastic wrap (long sides first) and then pat it down. Now move the completed pastie to a greased sheet pan (yes it needs sides unless you like the smoke alarm going off and huge mess). My grandpas were coated with black pepper before cooking (and marked with a toothpick) . I have also done some with ripe jalapenos, cayenne pepper flakes and other variants. Use your imagination (on part of the batch). Bake at 375 / 350 convect for 1 hour . Done is 190-195F internal temp. (lower and the potatoes will NOT be done). If you will be freezing some for later they can be pulled at 150-160 F.
Cool for 10 min and serve. We love ours with cole slaw or a fresh garden salad and vinaigrette as well as some beer or wine. In our family, the pasty is cracked open and smothered with ketchup (and for some, home made hot sauce). For many folks, that would be sacrilegious, but to each their own. These are so good as “freezer food”. Cool and use a spatual to break free from the pan. Place the pans with the pasties in the freezer and freeze solid (over night). Remove and vacuum bag individually. These keep really well. Reheat for 45-55 min at 325F for an easy fun meal . Note that skipping the freezing before vacuum bagging is NOT recommended. You ruin the crust as I have demonstrated in the past. I love dried and cured meats. Unfortunately, Prosciutto is not good for the budget and very hard to make. So I have been researching again, and came across something that appears to be simpler – Lonzino. This is cured and dried pork loin. The recipe is based on one in the book: Dry Curing Pork by Hector Kent. Plus the wrapping technique came from Youtube. These are done by weight percentage, based on actual weight of the meat pieces. This is much easier doing the weights in metric units – grams than imperial units. For each loin take the salt and cure # 2 and add either the palin or savory spice mix. Rub the pork loin thoroughly with the mixture and place in a zip lock bag in the fridge for 2 weeks turning every few days. Over this time each piece lost 25 g or so of weight. After the 2 weeks , the pork is ready for drying. Each piece is tightly wrapped in 1/2 of a collagen sheet (from the Sausage Maker on Amazon) and placed in butcher’s netting. It is then dipped in a penicillium mold solution so that healthy white mold will take over the exterior and out-compete nasty intruders. 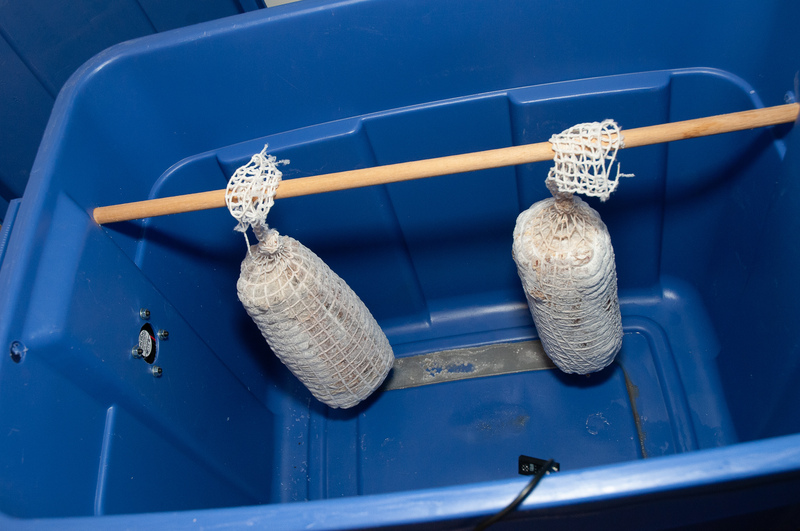 The wrapped pieces are hung on a 1/2″ dowel inside a rubbermaid bin that is then placed in the basement shop which at floor level, is about 55 degrees in the Wisconsin Winter. The initial weights were taken and they were 1001 and 1004 grams. The proper environment for drying is around 55 degrees F and 75% humidity. 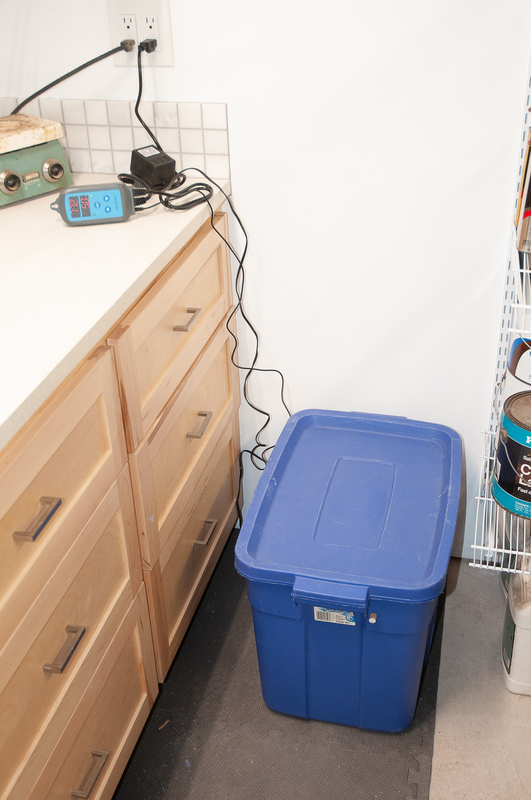 Reading the recipes everyone is talking about keeping the humidity high but my drying chamber is a large rubbermaid bin and the humidity is too high. I had sanitized the bin with Star San and left it wet before adding the meat. So I took a 40mm diameter 12v fan, HEPA filter for a respirator, 12v wall wart power supply and the Inkbird humidity controller as the starting point. The 3d printed pieces hold the dc power connector for the fan and the filter. I gave up trying to make the “ears” to hold the filter on the snoot and settled for hot melt glue. So far the humidity level is holding nicely. The meat needs to lose 30-40% of its original weight. Maybe a few weeks. After the previous success with the Koji rice marinated steak we wanted to try another to see if it is repeatable. The answer in short is that- It Is! The rib steak was coated with seasonings and the slightly crushed Koji Rice and placed in a bag in the fridge for 3 days this time. 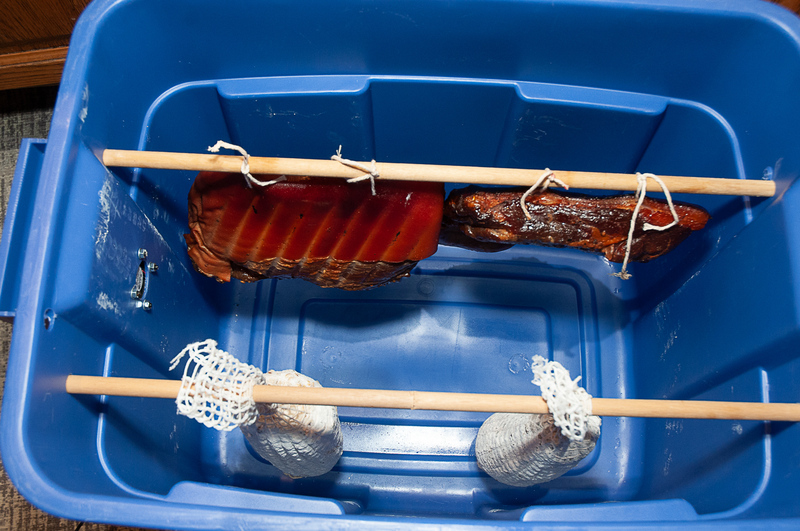 It was removed and the rice scraped off and placed in a vacuum bag for the Sous Vide cooking. Given that this was a nearly 2″ thick piece we went for 4 hours at 130F. After this it was tossed on the blazing hot charcoal for 90 sec per side and brought in to rest. Meanwhile there were leftovers to improve. One of our family holiday staples is cheesy potato casserole. Teal makes the potatoes chunky rather than sliced and this is good. I enjoy the crunchy edges but there never seems to be enough. Given that Teal made an extra large batch for Christmas I had plenty of left-overs but few edges. So what to do? Here I take a hint from Grandma’s Polenta left-overs. Mix the 2 together well. 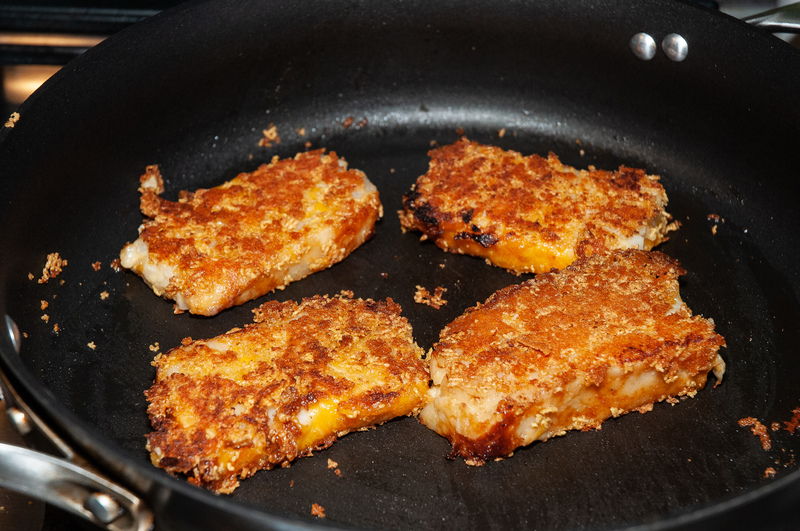 Place the slabs of potato casserole on the Chex & Cheese mix and press into the coating on both sides. Place in preheated skillet with butter that has already browned and then brown the potato mix on wn both sides. Serve with the steak (or have as a meal all on its own). 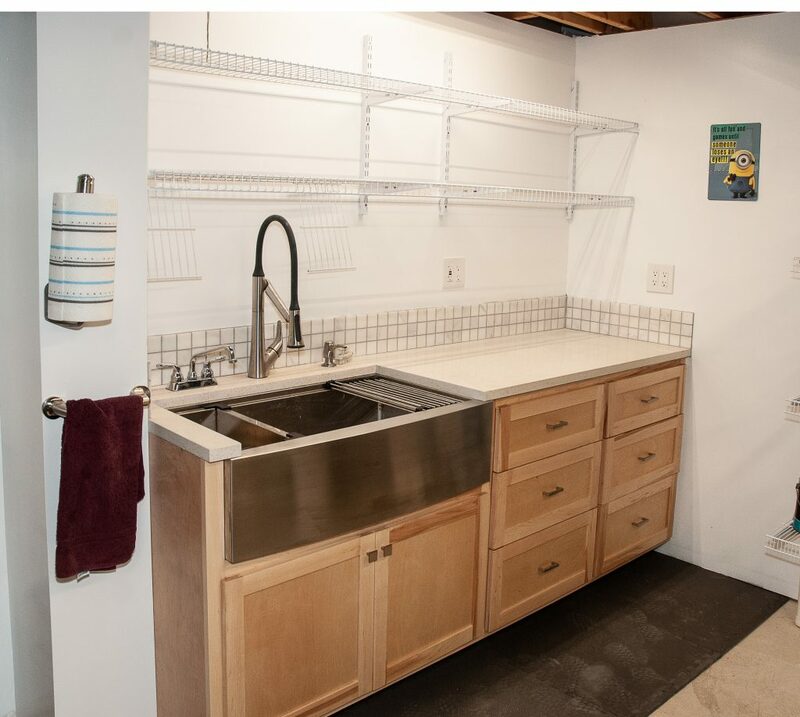 When we built the house I had a utility sink put in the basement shop. It has served well over the years but the lack of a counter-top and ugly old file cabinets for tool storage coupled with being a cold area in the winter due to the walls being half exposed, it was time for a remodel. This area is under our dinette. 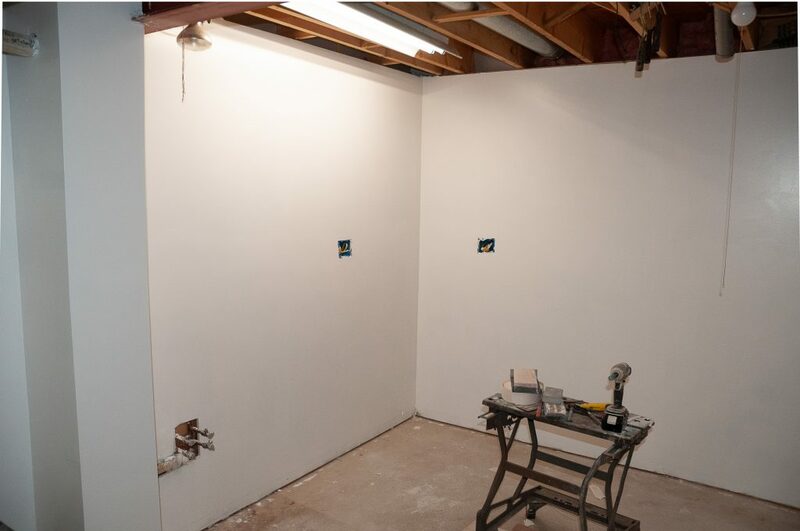 The space is also used for paint / finish storage, metal lathe and some lumber storage. 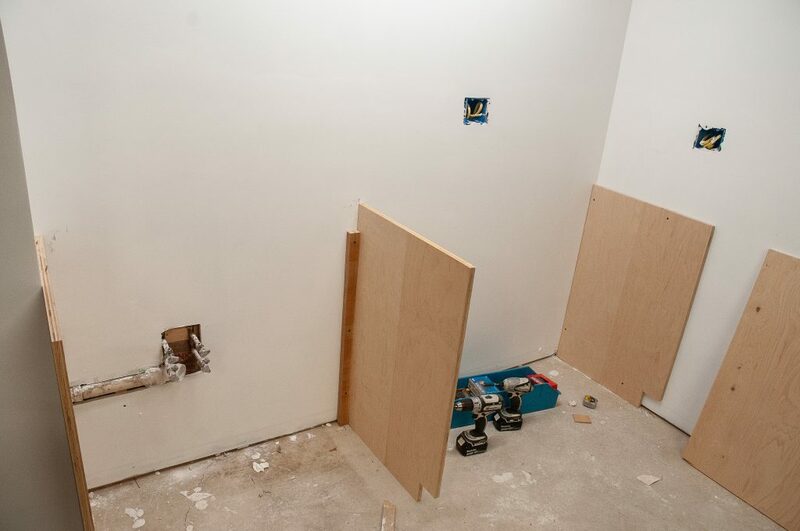 The new area had to have a large sink – big enough for brew kettles, fermenters and kegs. Dual faucets – one high reach for cleaning and a second with garden hose connection for an immersion cooler for brewing. Solid surface counter top and storage that looks nice were also required. First step was to pull the sink, remove the old file cabinets and storage shelves. Next the two walls were covered with plastic vapor barrier, framed in, electrical roughed in, plumbing roughed in with the valves installed (needed to have the water back on), insulation installed and the dry wall done. Pretty basic stuff. Now the fun began. 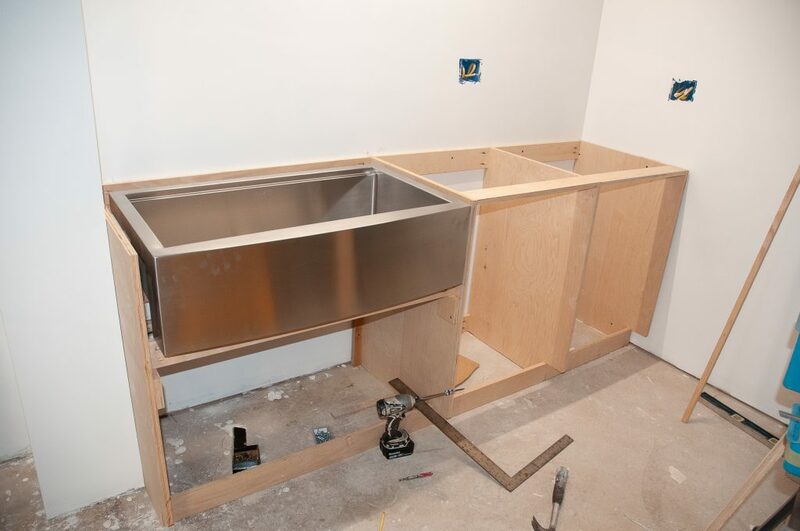 The starting point was the sink, a 36″ Ruvati farm house stainless was ordered. A high arch Kohler faucet was found on sale and the Kohly utility sink faucet was ordered. FOr utility faucets, you need to check that they are NSF approved for drinking water – many are not. A trip to the Baraboo Habitat for Humanity Restore provided the quartz counter top pieces. Birch plywood was procured for the cabinetry and I had some maple lumber already on hand for the face frame and the edges of the planned shaker style doors and drawer faces. Cabinet walls are 3/4 ” birch plywood. 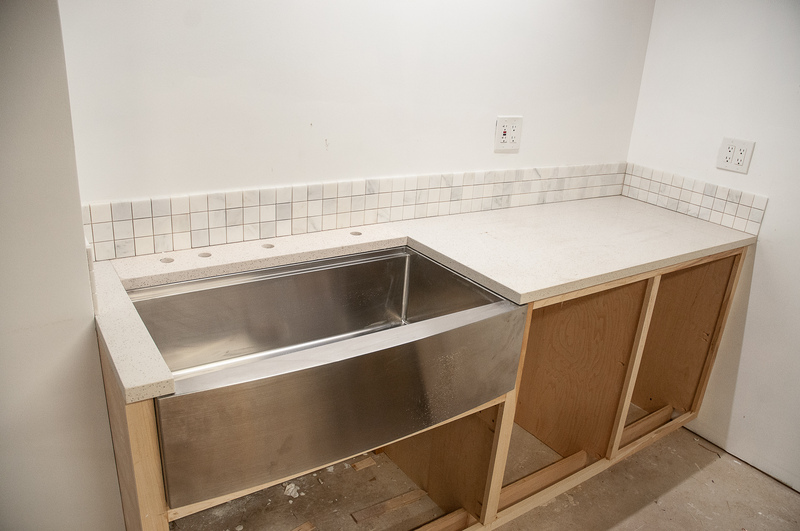 These were screwed and shimmed to the end walls and the intermediate pieces were placed to allow for a 5-6″ counter lip to the left of the sink and approximately equal sized ranks of drawers to the right of the sink. Using pocket screws the assembly goes quickly. I just have the Kreg mini jig and their clamp (which is very nice). A few of the pocket holes had to be done with the jig held by hand. Using double stick carpet tape on the back of the jig helps tremendously. The day I had to cut and polish the top and edges was miserable: 35 dropping to 31 degrees, drizzle turned to rain and then snow as I was outside wet sawing and wet grinding and polishing the edges. I came afterwards in a soaked and frozen popsicle. Paul came and helped lift the larger piece into place. 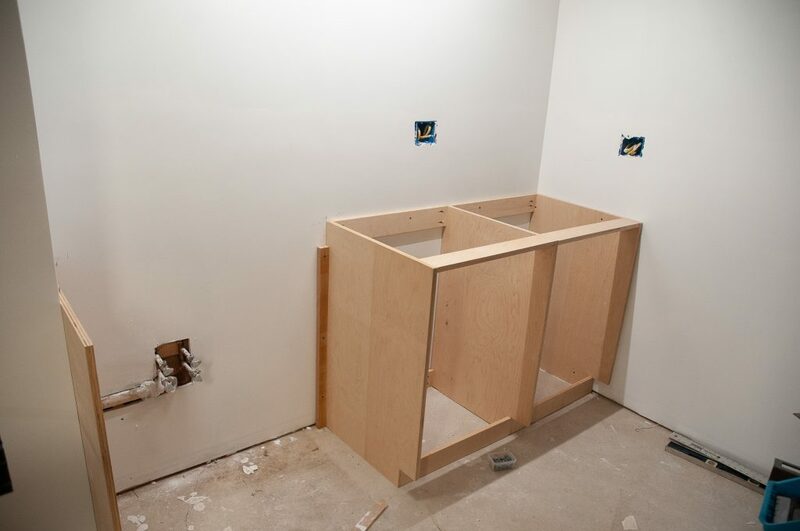 The faucet and soap dispenser holes were cut in the back piece prior to installation. The 3 pieces were glued with thick 30 minute epoxy. Below you can see the counter top installed, glued in place. Next the top joints were ground and polished flush. Next the sink was inserted (I could have left a bit more room). Clear silicone was applied to the top lip of the sink and then it was wedged upwards into position. The backsplash is made of marble mosaic tiles (another close out special). Marble has the advantage of having finished edges unlike many mosaic tiles. The drawers are simple plywood boxes with drawer lock joints. This is a fast, strong and easy way to make the drawers and all you need is a table saw. Below is a close up of one of the joints. The drawers are mounted to full extension K&V slides. 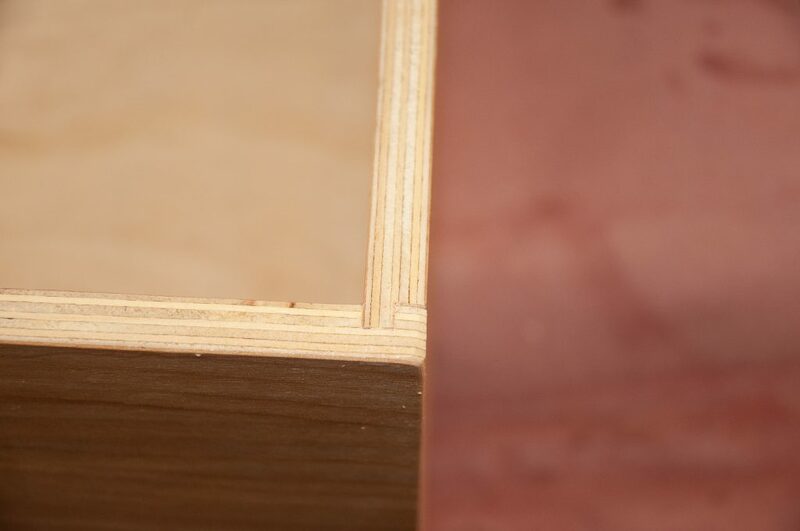 I added spacer blocks on the inside of the cabinet so the slides would clear the face frame. This was far less expensive than the special face frame brackets for the slides would have been, plus I did not have a plywood back on the cabinets which is needed for the rear brackets if they are used. Drawers are 8, 10 and 11″ tall allowing room for power tool storage. Shaker style doors are easy to make on the table saw. All of the pieces get a 3/8″ deep dado and the rails get 3/8″ tenons on the ends. The plywood panels are also glued in place in a few spots adding to the rigidity. Finish is 3 coats of satin water based polyurethane that was brushed on. Tools are in the drawers and the space is ready for the next batch of beer.